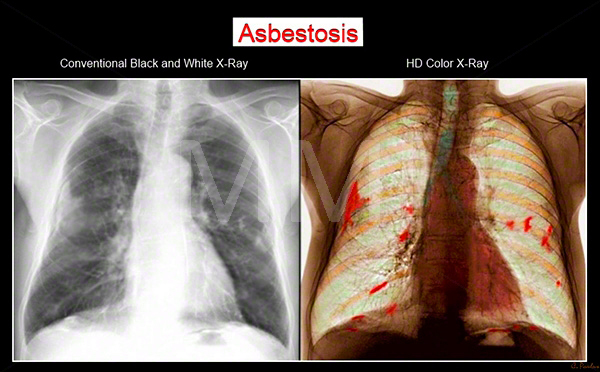 Asbestosis is a lung disease caused by exposure to the mineral asbestos. Chronic inflammation of lung tissue is the hallmark of asbestosis, which is significantly more common among people who have worked with asbestos in years past. During that time, there were few, if any, safety precautions to limit workers’ exposure to this toxic mineral. As a result, people who were regularly in contact with asbestos are at a higher risk of diseases such as asbestosis. Cancer, such as mesothelioma, is yet another disease that people exposed to asbestos may face. The risk of cancer may also be increased in people who are suffering from asbestosis. Consequently, it is important to recognize and understand the symptoms of asbestosis for proper medical diagnosis and treatment. As previously noted, asbestos is also the cause of several diseases other than asbestosis. Cancer risks, in addition to mesothelioma, include lung cancer, cancer in other organs, and cancer of chest-cavity tissue. The signs and symptoms of these diseases are different from those of asbestosis. When a person inhales asbestos fibers, those fibers may become lodged in the lungs and in the lungs’ air sacs (the alveoli). Because the body recognizes the asbestos fibers as a foreign substance, it has an immune reaction to them that produces inflammation. The inflammation signals the body’s attempt to destroy the invaders; however, in the process, fibrous scar tissue is laid down in the lungs. This scarring is known as interstitial fibrosis. The fibrosis makes the walls of the air sacs thicker, which reduces their functioning. As a result of reduced lung functioning, shortness of breath occurs. In advanced cases of asbestosis, the reduced lung function can induce “cor pulmonale,” or right-side heart failure. How Might I Have Gotten Asbestosis? There are a number of ways that a person may have gotten asbestosis. Often, it is caused by a prolonged exposure at one’s place of employment. People are at a greater risk of developing asbestosis if they worked in the processing of asbestos, in asbestos mines, or if they worked with any of the thousands of asbestos products. Although the risk of exposure was greatest in the period from the 1930s to the 1980s, today’s older homes also pose a threat. As older homes are renovated, workers are vulnerable to asbestos-containing building materials and potentially toxic exposure that causes asbestosis. Even people who never physically worked with asbestos have developed asbestosis. For some people, exposure came from asbestos ceiling or floor tiles in their place of employment or from when their spouses came home from an asbestos-related job with asbestos fibers clinging to their clothing and shoes. In most cases, the asbestosis makes itself known about five to ten years after the asbestos exposure. Is There a Cure? What Can I Do Now? If you or a family member has been diagnosed with asbestosis, it’s good to learn all that you can about the medical condition. It is also important that you understand your rights and options. The best way to do that is by contacting an attorney. When choosing a lawyer, select one who has experience with asbestos cases. See our list of Best Natural & Alternative Remedies for Mesothelioma Cancer. You’ve come to the right place for information regarding asbestosis. At Mesothelioma Treatment Center, we are here to help. If you have any additional questions, feel free to contact Mesothelioma Treatment Center online for assistance regarding asbestosis.